Kobo opened the Kids Store section of the Kobo ebookstore last October with little media attention or fanfare, and today they are expanding it in the shadow of Amazon's smartphone launch. 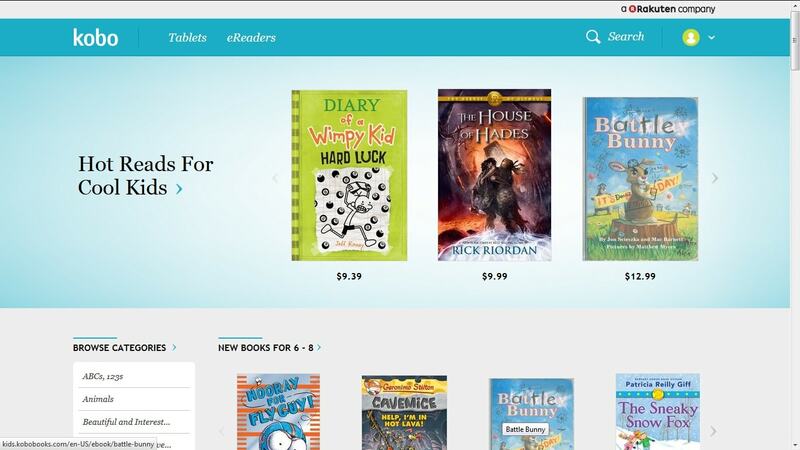 Toronto-based Kobo announced on Wednesday that their Kids Store is now available to readers in the UK. Limited to less than 100,000 titles from Kobo's catalog of over 4 million ebooks, the Kids Store is designed to offer kids "age-appropriate" reading choices. Equipped with safe-search features designed to allow kids to easily browse and find safe books to read, Kobo makes it easy for children and young adult Readers to find the next safe book – from the latest bestselling series to “read along” books to colorful picture-books. Kobo gives parents the ability of adding a limited-access kids account to their existing Kobo account. The subordinate accounts are limited to only accessing the Kids Store, and each account is can only spend as much as the parent allows (like buying gift cards). Kobo has taken steps to guarantee the safety of both the kid and the parent's pocketbook, but unfortunately they did not build a system which is designed to help kids grow or one which reflects how a household shares books and ebooks. For example, there's no way to share an ebook across both a parent and kid account, which is a little ridiculous given that one adult owns both accounts, and there's no way for a kids account to be merged back into a parent account after the kid ages out, thus preventing parents from making use of the ebooks they bought. It's also not possible for a parent to buy an ebook and gift it to a kids account. This both limits a parent's ability to use their own judgement in choosing safe ebooks, and it will also negatively impair a kid's schoolwork should they be assigned adult books to read. Admittedly, I had a unique reading teacher in the 8th grade (not every teacher will make the effort to encourage and enable students to see Les Mis on stage) but that doesn't make my point less true. While the idea of protecting kids is sounds great, Kobo's focus on keeping kids safe limits the usefulness of their platform. I made that point when I covered the Kids Store in November, and unfortunately it is still true today. And that is a shame, because the idea of a kid account is a good one - it's just Kobo's execution that is still lacking.